Camera 3 is yet another Orbit AF (they're multiplying!!). This is my oldest Orbit AF and the mechanical pan/tilt is about worn out. It still moves around but it is no longer repeatable enough to do preset positions well. The TrackerPod that used to be on Camera 3 suffered a servo failure and has been retired. I don't miss the loud noises it made when some web visitor would pan it in the middle of the night. 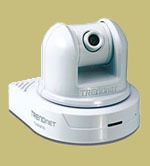 Camera 4 is a very inexpensive wired Ethernet IP camera with motorized pan/tilt. It's called a TrendNet TV-IP410 and for the money you really can't beat it. The mechanical pan and tilt are surprisingly smooth, accurate and quiet, and the image is reasonably sharp. This camera is now fully supported by AbelCam's IP-PTZ interface. Camera 5 is another Logitech Orbit AF. Refer to Camera 1 for more information about Orbits. Camera 6 is a Microsoft Lifecam Cinema. It has no motorized pant/tilt. This camera produces nice quality video when it works right, but much of the time it doesn't want to work right. Camera 7 is a little Supercircuits "lipstick" color CCD camera. This camera puts out NTSC analog composite video, so it is brought into the computer through a capture (digitizer) card. It's a pretty nice camera with good image quality though the analog output is a bit inconvenient since a digitizer is necessary to get the signal into the PC. This camera is using AbelCam's "virtual" pan/tilt feature with Input Size > Output Size, demonstrating how "virtual" pan/tilt can support preset positions and directional controls even when the camera is not zoomed. Camera 8 is an old Sony camcorder. Video output is NTSC analog fed into a capture card in the same manner as Camera 7. It has no pan/tilt capability. Camera 9 is a Linksys WVC54GCA IP Camera. It can be run wireless but I'm running it wired. It has lousy video quality - don't buy one. This camera is using AbelCam's "virtual" pan/tilt with Input Size = Output Size, which simulates pan/tilt when the cam is zoomed. Camera 10 is the video module from a broken Orbit AF. The AF's motorized pan/tilt failed but the camera itself still works fine. This camera uses AbelCam's "virtual" pan/tilt feature with Input Size > Output Size in the same manner as Cam 7.